sweeeeet...that fixed it! thank you! I will try it this evening and it makes me want to adapt my baby FMS project at this A380 ! I have just tried the A380 with the tom ruth's VC. So I don't know how work the PA VC and also the version of facked. I will try his VC this evening. I don't know the difference between a FS9 and a FSX .mdl file. But as I must re-write the xml code of the gauge, maybe there is a solution..... My FMS has many many scripts and the impact on the FPS is tiny. Congratulations Facked, this VC is great !! My only concern is when flying online on IVAO network, the need to be able to do a direct to any waypoint in the FPL. 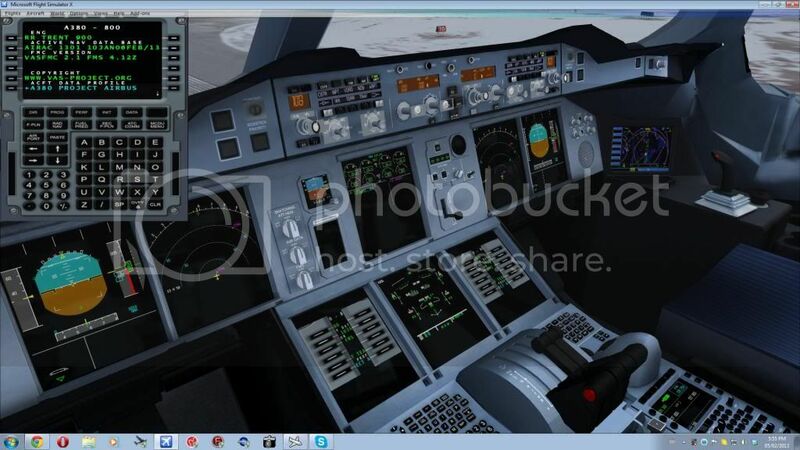 fdd_fr wrote: I will try it this evening and it makes me want to adapt my baby FMS project at this A380 ! May be Fdd your baby FMS project would be the answer ? The autopilot is really messed up! How can I fix it! The LNAV isn't correct! VAS won't work in FSX. Replace the gauges with Francois' ones if you want more functionality than the default ones. Alexis wrote: VAS won't work in FSX. Please help! Where can I download those gauges? How can I place them in? You change the respective gauge coordinates in the panel.cfg, [VCockpitXX] section. Here's the map with the coordinates, (0,0) being the top left corner. Alexis wrote: You change the respective gauge coordinates in the panel.cfg, [VCockpitXX] section. Okay I will see. I still don't quite get it. My question was on the Autopilot. Why isn't it working? And for the Vas FMC does it work for FSX? How can you open cargo doors on the A380 model FSX? I have tried your VC. But It is a FPS killer. I think that your work isn't the reason. When I will have time, I will see what I can do. fdd_fr wrote: I have tried your VC. Indeed it is, because the model isn't FSX native. That could mean 5 to 25 FPS more. Is there's a chance for a FSX native A380? No native A380 VC. It isn't good enough in comparison to other FSX cockpits. 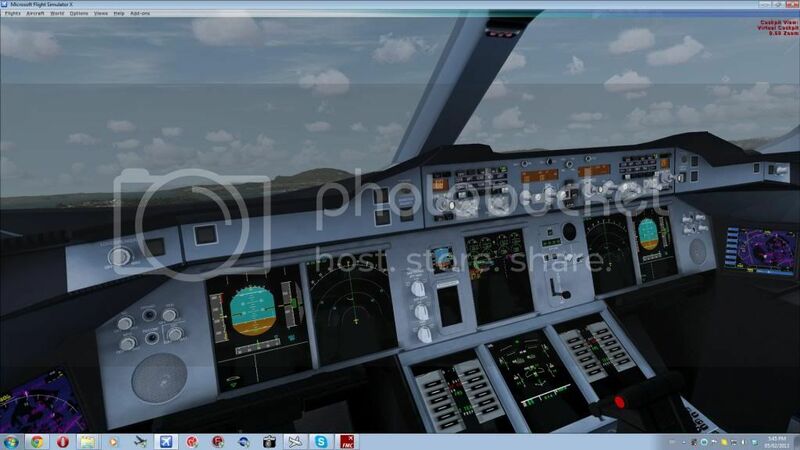 Do you think you can continue your mega merge for fsx with this model ? Thank you for answer news about your project. VASfmc does work well in FSX as long as you have version 2.1...or the latest one anyways. Only problem I have is the "clickspots" from the MCDU and FCU. Please refer to pictures below. Any advice, tips or corrections would be appreciated Surely I'm not the only one who would love to get this bird airborne. edit..Brake Accumulator gauge, digital trim, and VDA have all been added since picture taken. Still no joy on clickspots. Have you tried fullscreen mode? I had some vasfmc clickspot issues in windowed mode from time to time, although usually just a very small offset of a couple of pixels. So ALT+Enter may help. Still no joy, even on full screen mode. Perhaps Facked can help us with this topic, perhaps point us in the right direction on the steps needed to take to correct this problem, as in the early stages of the project, he had these overlapping textures. Here's the full screen picture. cdnavi8r wrote: Still no joy, even on full screen mode. Can you tell me, how to get the terrain and brake views under the PFD/NDP. Or is it just because youswitched from Window to Fullscreen mode?!?! Those THS and VDA were from the original panel by the creator of the FSX vc..I just readded them in the VASfms screens. cdnavi8r wrote: Those THS and VDA were from the original panel by the creator of the FSX vc..I just readded them in the VASfms screens. Could you upload on vatsim your aircraft and your version of vasfmc. I can't wait because i love Vasfmc ! And what about the 2d panel ? I won't..can't release without permission from the original owner. I have not tested the 2D panel with this, nor do I really intend to. cdnavi8r wrote: I won't..can't release without permission from the original owner. Can you ask him for his permission please?! It's a veru good idea !! Could you please upload a sceeenshoot from the 2d panel ? Hey man.... do you think you could do a little tutorial or something like that on how you got it to work with the pa a380....cause my earlier tries all failed. K, guys, I sent a message to the owner/builder if this FSX panel, hopefully we can get steps started in the coming days. Just awaiting a response to see where we stand. Today is the day that some of you have been waiting patiently. The day that you can fly the PA A380 in FSX converted by me. Don't forget that this is Unofficial conversion of the PA A380, so expect some bugs. Do you think you are going to create a overhead panel 2d for the a380 ? Im very impatient for that. Can we add other liveries instead of the Emirates? LINK DEAD! PLEASE POST NEW! it looks like that Avsim have removed or delte the Files in the Libary. So please can anyone reupload this or maybe send me the files per mail? Also i try to contact facked but i get no response. Same question... i really enjoy looking your pictures each time i visit this page, but could never download your work from avsim.net because the file isn't there anymore. Will it possible to download your updated VC for FSX at some point in future? VC isn't for FSX. He's just corrected bugs. I meant the corrected version, he uploaded some time ago. Is there a possible to get the corrected file? I don't know. I had this file, but I deleted it, because that VC drops FPS very much..
a fully working tweaked PA A380 with the FS9 A380 VC modified by 'Facked' to work in FSX without any problems (at least for me, with vasFMC installed), works like a charm. Does anyone have this package? The one from rikoooo has no working ECAM. P.S. ECAM is working in 2D panel only. I don't know why. Could you upload it again please??? Im uploading it 2nd time.. No one reads posts above. Okay does anyone have the vc with a working ECAM by facked? What the panel cfg or aircraft cfg. Or just a regular file? OK I **think** I found it, add ANTEXP in the title in the fltsim.X section, just like the way you add the HUD, tell me if that works. Is there an ILS button in the VC?